Greeting the Sri Lankans on the occasion of their New Year, US Secretary of State John Kerry has said that the United States stands ready to partner with the island nation as it works to make progress on reconciliation and accountability. “On behalf of President Obama and the American people, I am eager to support the Sri Lankan people in this journey as you work to make progress on reconciliation and accountability four years after the end of the conflict which divided your country,” Kerry said yesterday. 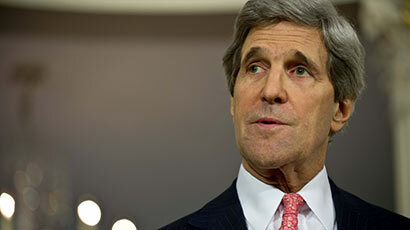 Kerry congratulated Sri Lankans around the world as they celebrate Sinhala and Tamil New Year. I wonder how the north Koreans should view once a year war games by the YS and the S.Koreans at their doorstep. Better not to have both loonies and hypocrits as friends. Thank you for your New Year greetings and wishes. Some small corrections. You can get your advisers and speechwriters, to correct some notes. You do not want to say the Sun is going round the Earth, when the evidence points to the other way around, Earth going round the Sun especially in this day and age. 1. The New Year that falls on April 14 th is Solar based, and was originally a Hindu New Year. The Solar based Hindu New Year is followed by people of Kerala, Tamil Nadu and Bengal, and falls consistently on April 14th every year. This also coincides with the Sun being Directly over Lanka during this period, just a coincidence, as the New Year is astrology based. Vishu – Vishu is the Zodiac New Year observed in Kerala by Malayalis. It falls on the first day of Malayalam month Medam (April – May). The calendar followed in Kerala is a solar calendar and the New Year date is constant mostly – April 14. Nyepi – Nyepi is the New Year in Bali Island in Indonesia. This calendar is also based on the Saka Era but with major regional variations. Nyepi is based on lunar calendar and therefore the date varies yearly. Bali was a Hindu Island and still is Hindu Island. 2. Initially the natives of Sri Lanka were Veddahs, Yakkas and Nagas. Later around 550 BC Prakrit Kalinga, Orissa and Bengal, immigrants, who were Hindu and Jain, came, and introduced their hierarchy and language, with Sanskrit roots, Sinhala. 3. The New Year was then called Hindu New Year. Almost all the natives and Newcomers celebrated, the Hindu New Year, whether they spoke Sinhala, or Tamil or other. 4. Later on Buddhism was introduced, and some of the Hindus accepted Buddhism, but continued to celebrate the New Year. The Sinhala speaking people were mostly Buddhist and the Tamil speaking people mostly Hindu, and the New Year came to be known as Tamil and Sinhala New year or Hindu and Sinhala New Year. It was never known as Hindu and Buddhist New Year, as Buddhism follows a different calendar. 5. Mr. Kerry, you congratulated Sri Lankans around the world as they celebrate Sinhala and Tamil New Year. We thank you for your greetings, and hope you will help keep Sri Lanka to be One and celebrate One New Year, despite the different imported beliefs in the past and resist the hegemony of one group of people over the others advanced by the extremists.